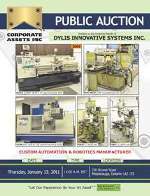 Corporate Assets Inc. | Dylis Innovative Systems Inc. - Corporate Assets Inc. FEATURING: VIPER (1997) VMC 1000 AG CNC vertical machining center, ECOCA (2009) SJ-1860V gap bed engine lathe, FIRST LC-20VSG vertical milling machine, FIRST LC-185VS vertical milling machine, HYD-MECH S-20P horizontal band saw, ER MAIER KM1012 vertical band saw, CHEVALIER FSG-618M surface grinder, FIRST LC-25A drill press, FLEX ARM tapping unit, PRO-PEN P-3000/D electronic engraving machine, ENERPAC 30 ton hydraulic shop press, CYCLONE shot blast cabinet, ATLAS COPCO GA 115 rotary screw air compressor, ATLAS COPCO FD 115 air dryer, LINCOLN CV-300 digital mig welder, NISSAN 6850 lbs. indoor lpg forklift, DEMAG 5 ton rolling A-frame gantry crane, large quantity of tool cabinets, precision tooling and inspection equipment, factory support equipment, office furniture and more!